ALBUQUERQUE, N.M. — My color crush for August is purple. This is the royal color of eggplant and kohlrabi, and also purple cabbage, carrots, cauliflower, garlic, onions, potatoes, beans, blackberries, grapes and plums. 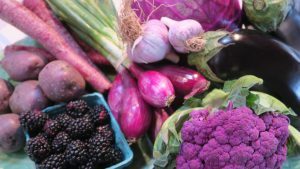 Right now New Mexico farmers have a great selection of nutrient-rich purple foods available at growers’ markets, farm stands and select grocery stores. As a rule, the darker a plant, the more antioxidants it contains. Purple and blue fruits like blackberries and plums are rich in antioxidants that combat free radical damage, and can help keep skin looking younger. Purple cabbage, eggplant, blackberries, black currants, purple onions and concord grapes have a natural purple pigment that contains flavonoids, including resveratrol, that keep blood pressure in control and boost immunity from certain cancers. 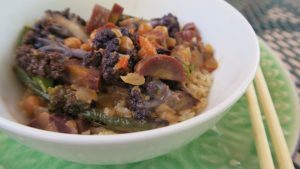 Purple carrots and purple cauliflower have powerful antioxidants that are high in anthocyanins and pro-vitamin A carotenoids. They may help with glucose control and weight management. Most purple foods are no different to cook than their non-purple counterparts, but two worth special consideration are eggplant and kohlrabi. Kohlrabi is that mysterious, purple (or green), knobby bulb that looks like it’s from outer space. Its taste is mild, has a texture similar to broccoli stems, and is surprisingly versatile. Start by removing the tough outermost layer of the bulb with a vegetable peeler. Then try one of these three quick ideas for preparing it, or just roast or steam it. EAT IT RAW: Raw kohlrabi is slightly crunchy and mildly spicy, like radishes mixed with turnip. You can toss it in a salad, make a slaw out of grated kohlrabi, or eat it by itself with a drizzle of good olive oil and a sprinkling of sea salt. PURÉE IT INTO SOUP: Kohlrabi is especially good in creamy, puréed soups with mild spices. Kohlrabi can also be added to recipes for cream of potato, cream of broccoli, and even cream of mushroom soup. MAKE FRITTERS: Shred it and mix with an egg, a few tablespoons of flour or breadcrumbs, and your favorite herbs or spices. Heat oil or butter in a flat skillet, drop in small mounds, and flatten slightly with the back of your spatula. Turn after a few minutes, and serve when both sides are crispy. 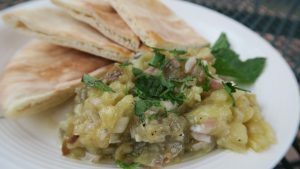 And then there is eggplant, a hearty vegetable that goes well with so many meals. Why don’t Americans eat more eggplant? Maybe it’s because it’s one of only a few vegetables that you can’t eat raw. Or maybe it’s because eggplant has a reputation for being bitter. While eggplant can become bitter as it ages, locally grown eggplant – available in many varieties – is fresh and tender. And that means you don’t need to “sweat” out the bitterness with salt. Delicious eggplant recipes abound, so get adventurous! Next time you’re at the growers market, see how many purple foods you can spot. Then, see how many you can bring home to turn into delicious, healthy meals. Heat broiler. Prick eggplants several times with the tip of a knife. Broil 3 to 4 inches from heat, turning occasionally, until soft and charred all over, about 30 minutes. When cool enough to handle, remove skin. Place eggplants in a colander set over a bowl; let drain for at least 30 minutes. Halve eggplants lengthwise; discard seeds. Chop flesh finely, and place in a bowl. Combine vinegar, lemon juice, olive and vegetable oils, onion, garlic, sugar, salt and pepper. Add to eggplant; mix to combine. Serve at room temperature sprinkled with chopped mint and parsley. Preheat the oven to 425 degrees F. Line a baking sheet with parchment paper or aluminum foil, and brush the foil with a bit of coconut oil. Place the vegetables and chickpeas on the sheet and drizzle them with the rest of the oil and sprinkle with salt. Bake for 20-30 minutes, until the cauliflower florets are soft. Next make the curry sauce. In a saucepan over medium heat, melt the teaspoon of coconut oil. Sauté the onions, garlic, and ginger for 3 minutes. Add the coconut milk and heat to a simmer. Melt in the peanut butter and stir until completely melted. Stir in the coconut aminos (or soy sauce) and spices. Reduce the heat and let cook for 10 minutes. Add the roasted vegetables to the curry sauce and serve. Preheat the oven to 350 degrees. In a pie plate, toast walnuts for about 5 minutes, until lightly browned. Let cool, then coarsely chop. Light a grill or preheat a grill pan. Brush the eggplant slices with olive oil and season with salt and pepper. Grill the eggplant over moderately high heat until lightly browned and tender, about 2 minutes per side. In a large skillet, melt the butter. Add the pear slices and cook over moderate heat, tossing, until just starting to soften, 3 minutes. Add the Cognac and toss the pears to coat thoroughly; remove from the heat. In a small bowl, whisk 3 tablespoons of oil with the garlic, vinegar, 1 tablespoon of the parsley and 1/2 tablespoon of the chives. Season the vinaigrette with salt and pepper. 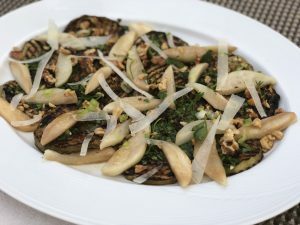 Arrange the eggplant slices on a platter and drizzle with the vinaigrette. Arrange the pear slices over the eggplant (without the pan’s extra liquid) and drizzle with the honey. Scatter the walnuts, cheese, and the remaining 1 tablespoon of parsley and 1/2 tablespoon of chives. Serve immediately.